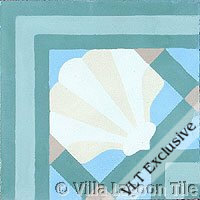 This series of cement tile patterns by designer Lundy P. Wilder are Villa Lagoon Tile exclusives. Some of these patterns are updated variations on traditional designs and some are modern motifs. Most of the patterns shown here are available as 10" tile for North America, using your choice of colors from the Caribbean Palette, however many are also available in other sizes and regions. You may want to see one of our other exclustive lines, the Stu Neyland Series.